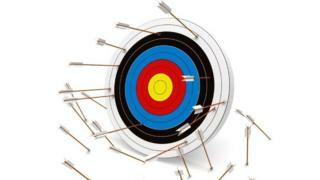 Does it matter if NHS targets are missed? Hospital targets are a blunt measure of performance. By their very nature, there is an absolute cut off. Fall above the line and you succeed. Fall below - even by one patient - and you fail. As a result it can create what you could say are anomalies. There are 21 local hospital services in the UK that have missed all their targets over the past 12 months. But are all the failures equal? I would suggest not. Take Leeds Teaching Hospitals for example. It has not hit one of its targets in the past year despite having 36 attempts to do so across A&E, cancer care and planned operations. But on the latter two it has hovered pretty close for much of the year. However, the problem - certainly as far as the BBC analysis done today goes - is that it has never quite managed to get over the line. A small swing upwards could have catapulted the service up the "league table". The same could not be said for the likes of East Kent Hospitals and many of the services in Wales and Northern Ireland that have been missing their targets by quite some margin going back years. What is more, Leeds is rated as a good service by inspectors at the Care Quality Commission, who take into account a range of factors, not just its performance against waiting times. Now compare that to some of the services that have done well in the BBC analysis. A number of those are in the north east, such as North Tees / Hartlepool and South Tyneside NHS trusts. Both are rated as requiring improvement by the CQC with inspectors concerned about safety and quality of care. So does it really matter if targets are missed? Talk to staff on the frontline and they tend to have mixed feelings about them. A&E staff certainly get frustrated when they are put under pressure to deal with a non-urgent patient quickly just because the clock is approaching the four-hour mark. Many doctors and nurses would say they simply ignore that and focus on which patients are the highest priority in terms of their illnesses and injuries. But that is not the same thing as saying they don't matter overall. Nick Hulme runs two local services - in Ipswich and Colchester. Colchester is among the trusts which have failed all their targets for the past year. He says while it is very hard to see the vast bulk of hospitals being able to hit their targets regularly again as things stand, they should still stay. His reasoning? They hold the service to account, provide a clear marker of what is happening and - certainly in the case of A&E and cancer - are a good guide to quality as crowded A&E units and long waits for cancer treatment are a risk. "I've been around long enough to remember a time when we didn't have targets. It wasn't clear what was happening nationally and it meant patients were left waiting for tests and treatments without the pressure of a target to focus minds."